As a parent, I have answered a lot of questions. Why do I have to go to sleep? What is the ground made of? How many bones do humans have? Some answers I can quickly and easily find on Google and some are the simple response of “Because I said so!”, but questions on the topic of outer space continue to stump me. NASA App HD helps to shed some light on the infinite universe with both simple and scientific explanations to most everything space-related. 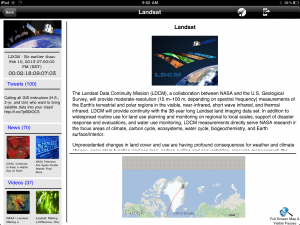 There’s almost an overwhelming amount of content and resources that can be accessed through the app. However the information is straight from the foremost authority on the subject and the images provided are actual high def photos taken by the world’s most sophisticated technology. 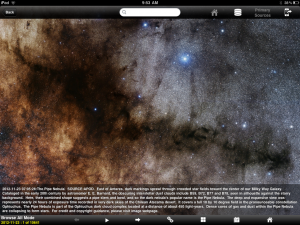 The main screen of the app features a snapshot of our own little corner of the universe, with a layout of the Milky Way galaxy with the sun and her nine planetary children. Clicking on each brings you to breathtaking images and stats for each respective orbiting mass; moons, asteroids, and meteors included. If those were the only options in this app it would still be an impressive tool to help teach about space, but there is an immense amount of tools available to explore further. Some highlights include an alphabetical listing of satellites, space stations, and outer-space technology that NASA has used to collect data. There are pictures, scientific data, objectives, and dates included with each. 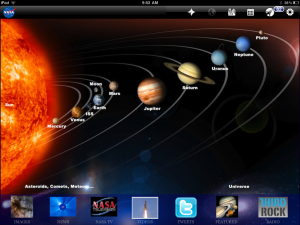 Another amazing link is the NASA news center with updates regularly with the progress of the space program. Solar flares, space station missions, new findings, and updated planetary news are just a small fraction of information available on a daily basis. If I addressed every section of this app you would be reading a review for about a light year. There is just so much to explore – almost an overwhelming about. While it’s a perfect app for kiddos who show interest in space studies, it can be frustrating for someone who doesn’t quite know what they’re looking for. The user interface is also very confusing and the main screen gives little direction as to which icons lead to which sections. Overlooking those minor annoyances, this free download is a stunning addition to your app library. Younger players can watch while older kiddos or adults navigate the app.